2018 Isuzu MU-X Facelift launched in India! 2018 Isuzu MU-X facelift has been launched in India. The full-grown SUV is priced much cheaper than Toyota Fortuner, Ford Endeavour and Honda CR-V. The SUV gets more safety features and some feature upgrades. Isuzu has facelifted its MU-X SUV and it now starts at a price of Rs 26.27 Lakhs for the 4X2 variant. The full-grown SUV gets some additional safety features and some tweaks to its design. The 4X4 variant is priced at Rs 28.23 Lakhs. The MU-X goes against the likes of Honda CR-V, Toyota Fortuner, Ford Endeavour and the upcoming Mahindra XUV 700. The MU-X was launched in India in 2017. 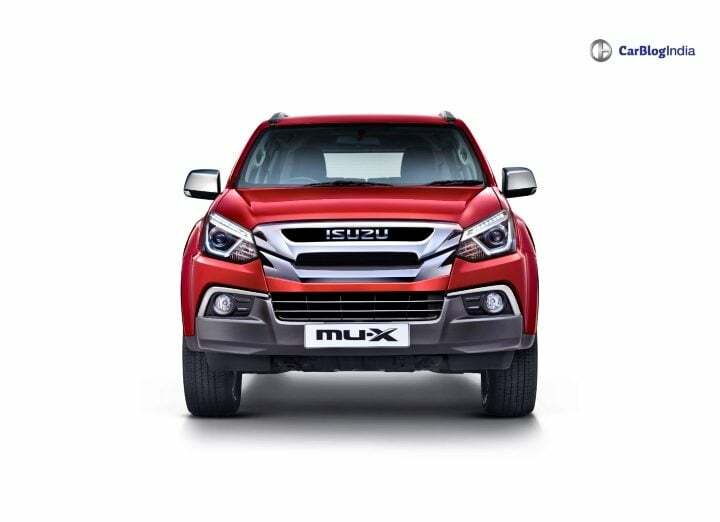 Changes in the design of 2018 Isuzu MU-X include a tweaked bumper style, inclusion of Bi-LED projector headlamps with LED DRLs, an updated front grille and a tweaked rear bumper with LED tail lights. It also gets a silver brush finish on the bumpers, a dual-tone rear spoiler, shark fin antenna with a gun-metal finish and a set of new 18-inch diamond cut alloy wheels. Inside the cabin, the 2018 Isuzu MU-X gets a sportier Lava Black upholstery with quilted leather seats. It also gets some silver plastic inserts around the dashboard. The 2018 Isuzu MU-X runs on a 3.0 Litre legendary Isuzu diesel engine. The engine produces 175 HP and a peak torque of 390 Nm. The SUV comes in 4X2 and 4X4 variants. For transmission, it uses a 5-speed sequential shift Automatic transmission. The 4X4 variants get a shift-on-fly select for off-roading. Since it is an off-roader, it gets a higher ground clearance of 230 mm and increased leading approach and departure angle. Additional safety features on the 2018 Isuzu MU-X include six airbags (front, side, and curtain) and standard fitment. Other safety features include Hill Descent Control, Hill Hold control, ESC, Traction Control, ABS, EBD and Brake Assist. The Isuzu MU-X facelift continues with features such as AC vents for all three rows, Passive Entry & Start System, Cruise control system, 7-inch touchscreen entertainment system, and Terrain Command 4WD select dial. Along with this, the 2018 Isuzu MU-X comes with 5 years warranty and 5 ears free periodic maintenance or 150,000 kms (whichever is earlier). Also Read: Isuzu D-Max V-Cross Facelift launching in 2019 – What to Expect? Currently, the MU-X is the cheapest option in its segment. However, the upcoming XUV 700 also might run for the tag of the cheapest in its segment.